Kaitlin in the Kitchen: BEST Sugar Cookies!! So out of all the sugar cookie recipes I've ever tried, not that I've been baking/cooking long enough to have tried that many..but from the ones I have tried, these are the best, no fail ones. 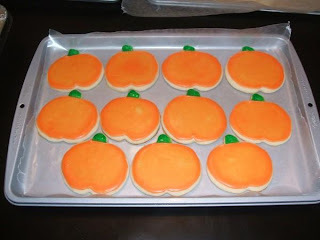 They are so perfect for cut out cookies! I'm not sure where I got the recipe, but last Christmas my mom and I were looking for a really good one because we were going to make tons of those cute cut out Christmas cookies like we used to when I was little. So I searched google and found a couple and we decided on this one and I'm glad we did! They come out perfect everytime. I had a great opportunity back in September to make a bunch of fall themed cookies for my husbands grandparents 65th wedding anniversary. They were having a fall themed get together at my mother in-laws house, and I knew these would be perfect, especially since there were going to be quite a few kids there. I also made some without icing and just put colored sugar crystals on them, but those aren't as photogenic, hence no photos. You can really decorate these anyway you like, I usually make a basic confectioner's sugar icing that my mom has been using since I was little, just confectioner's sugar and water. You can use milk instead of water if you'd like, I personally think the icing taste great with just water though. To decorate the ones I made I just dyed my icing with food coloring, and I made 2 batches of each color, a super thick batch, and a super thin. The thick batch was for a border so that the thin icing I would put in the middle wouldn't all run off the cookie. For the stems of the pumpkins I used some green sparkle gel that Wilton makes. Also, for the veins of the leaf I bought some brown Wilton food coloring gel. For all of the piping I just used plastic sandwich bags, nothing fancy. When the border had set I spooned the thinner icing in the middle of the cookie and just spread it over until it was evenly coated. With the holiday's around the corner and a lot of cookie baking to come, I hope some of you will try this recipe, and let me know if you do! Wow! Congrats to the happy couple! Married 65 years is not something very many people can say these days! What an amazing accomplishment. These cookies look great. We do lots of cut out cookies during various times of the year. It's fun for the kids. The Daring Bakers just did pizza for October. You should check out some posts from the members for the pizza dough recipe. I haven't tried it yet, but I've heard it's fabulous. hi kaitlin. just found your blog...these cookies look so perfect! i'd love to try one of those! Hi, Kaitlin - thanks for visiting! 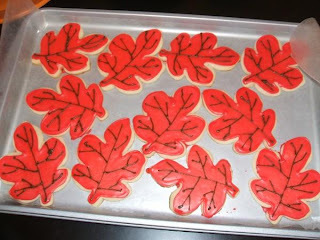 I love all your fall 'loot' - and these cookies are gorgeous. 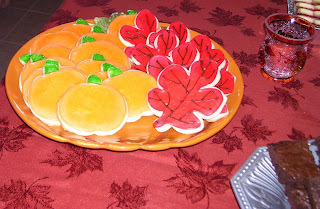 I need to make some leaves since the real ones are almost gone. See you soon! Really cute cookies! Thanks for the recipe! Hi Kaitlin, this is Bakingmum here. Paying you a visit. Your cut-out cookies look great. I would love to try your recipe soon. Virtual Memory sure is becoming cheaper these days. I wonder when we will eventually reach the ratio of 1c to 1 Gigabyte. I'm still waiting for the day when I will finally be able to afford a 20 terabyte harddrive, hahaha. But for now I will be happy with having a 32 gig Micro SD in my R4i.